Gouda Stuffed Burgers with Horseradish Aioli and Caramelized Onions are the perfect burger to transition dinner time from warmer weather favorites to hearty, fall family meals. It is no secret in our family that I love burgers! We grill a ton in the summer and burgers. Our burgers are usually pretty traditional with large slices of summer tomatoes and lettuce, grace our dinner table. They’re seasonal, their quick, and all 4 kids like them. But what about now that it is fall? We still have plenty of warm days in Colorado even in November. Just because the temperatures are cooler doesn’t mean we turn off the grill and only cook in doors. We do, however, start cooking with more seasonal flavors. Heartier and more robust versions of our summer favorites. I like these Gouda Stuffed Burgers with Horseradish Aioli and Caramelized Onions for instance. These Gouda Stuffed Burgers with Horseradish Aioli and Caramelized Onions can stand up to the changing fall weather and the evenings that are progressively getting darker earlier. We swap out light, crisp lettuce for greens like Baby Arugula that pack a huge flavor punch. Juicy summer tomatoes become rich and sweet, caramelized red onions. 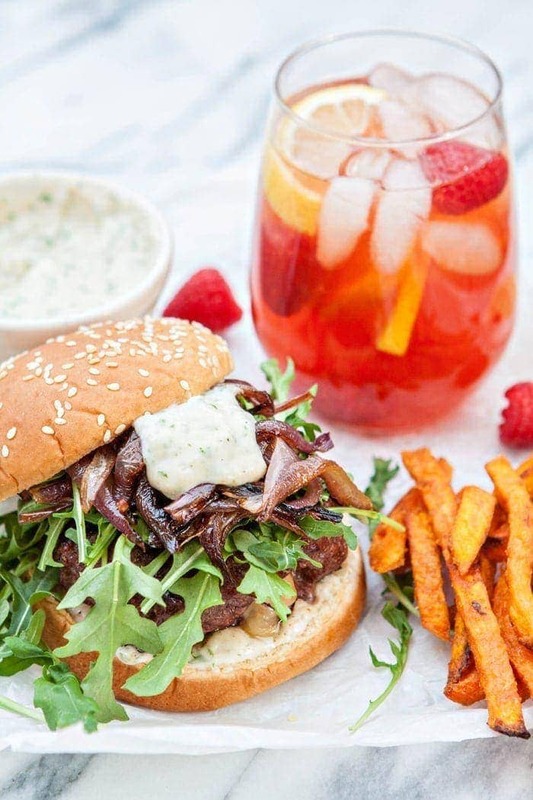 Rather than dressing the burgers with a simple ketchup, mayo, and/or mustard depending on your personal preferences, this burger is slathered with a Horseradish Aioli. And if cheese is your thing (I always like cheese with my burgers! ), we opted to stuff the burgers with Gouda. This recipe might sound like it has a lot going on. And in all honesty, Kevin and I both talked about the fact that, it doesn’t just seem like it has a lot going on – it really does. Yet, it all comes together, really well. After all our burgers over the summer, this one was a great way to transition one of our favorite foods for cooler weather. For sides, rather than serving seasonal summer favorites like zucchini and grilled corn (Fresh Zucchini Corn Salsa or Zucchini Tomato Basil Salad), we served hearty Sweet Potato Fries, which are Kendall’s current #1 food crush after her Slow Cooker Ham birthday dinner. For drinks we had Lipton Iced Tea on the side. I can’t think of a family-friendly drink that pairs a lot better with a burger than a glass of iced tea, and it was still plenty warm to enjoy an iced beverage with a Gouda Stuffed Burgers with Horseradish Aioli and Caramelized Onions. 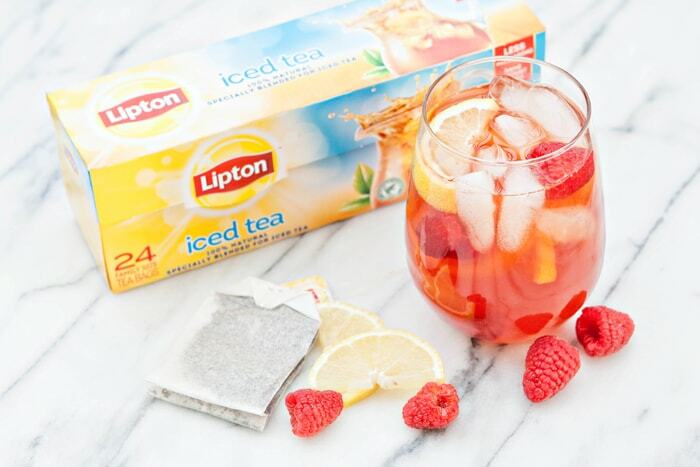 You might like to try these 11 Ways to Flavor Plain Iced Tea. We chose to flavor ours with lemon slices and raspberries to give it a fruity kick. Just place the fruit and tea bags in the pitcher. Then, pour the hot water over it and allow the fruit to steep with the tea bags. Family meal time is so important to us. Kevin works busy days with a lengthy commute. Between working, cooking, running errands, cleaning and working to get settled in our new home, I shuffle kids to and from various sports and after school activities. With 4 kids homework is no insignificant task. It is definitely a busy life, but it is a great one! I look forward to dinner every night because that has become our time to connect and be together as a family – and usually the afternoon schedule has calmed down by then. I want to spend that time enjoying good food with my family, and as often as possible, serving something that everyone likes so we can enjoy our time together rather than stressing about our meal. 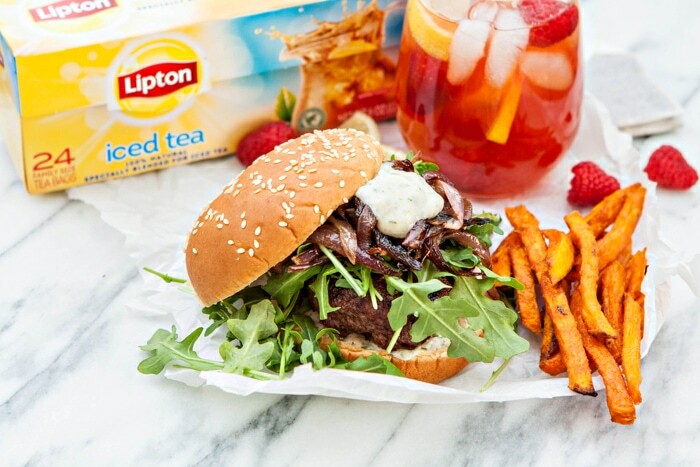 Burgers and ice tea are always a hit with our bunch! Especially when they’re these Gouda Stuffed Burgers with Horseradish Aioli and Caramelized Onions. Gouda Stuffed Burgers with Horseradish Aioli and Caramelized Onions are the perfect burger to transition dinner time from summer favorites to hearty, fall family meals. Combine all of the ingredients, mix well. Store covered in the refrigerator and chill while you prepare the rest of the burger components. In a heavy bottom cast iron pan, melt the butter with the olive oil over medium heat. Remove the peel from the onion. Cut it in half from end to end, and then slice the onion into 1/4 inch wedges. Add the onions, sprinkle with 1/8 teaspoon salt and saute for about 10 minutes over medium heat. Then, reduce to medium low and continue to cook for 20-40 minutes, or until they tender and golden, stirring the onion every 5 - 7 minutes. In a large bowl, combine the beef, Worcestershire Sauce, salt, pepper, and garlic powder. Using your hands or a sturdy mixing spoon, break up the meat and work the seasonings into it. After the meat and seasonings have been evenly distributed, divide the meat into 12 patties each weighing 1/6 of a pound - a kitchen scale covered with plastic wrap (to keep it clean) is useful to ensure evenly sized patties. In the center of each of the 6 patties, place 3/4 ounce of the shredded gouda cheese. With the remaining 6 patties, layer them on top of the cheese covered patties, and press at the edges to seal the two halves together and seal the cheese inside. Sprinkle the top and bottom of each burger patty with additional salt and pepper, if desired. Place the burgers on the grill, cooking for 3 minutes. Flip the burgers to the other side and continue cooking for an additional 2 - 4 minutes, depending on how well done you like your burger. Remove the aioli from the refrigerator. Spread each half of the bun with aioli, according to your personal preferences. 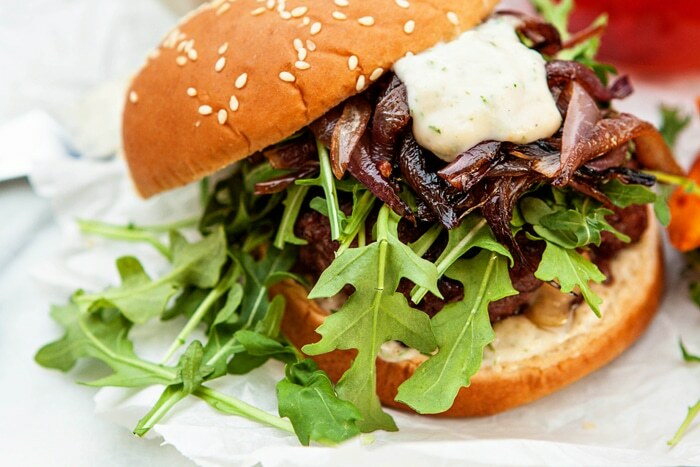 Place the cooked burger on the bottom half of the bun and top with baby arugula and caramelized onions, dividing it evenly between all the burgers. Place the top of the bun on top of the vegetables. Serve immediately! This recipe for Gouda Stuffed Burgers with Horseradish Aioli and Caramelized Onions is a sponsored conversation written by me on behalf of Lipton.